Hmmm...Nightwolve has no Encyclopedia Dramatica page. If I can find more info on him (I don't really keep up with the Ys scene) I'll try and change that. He sounds like a royal prick and deserves whatever the EDiots can throw at him. 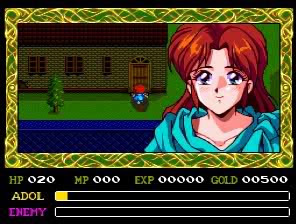 On the topic of this fandub though, I wanna be enthusiastic, but I've been scared of vocal fan translations ever since I played one for Secret Of Mana on Super Famicom (OH. MY. GOD IT WAS HORRIBLE). Hopefully this will be better. You know, English voiceovers have gotten pretty good lately. I mean most Japan origin games these days have at least serviceable voice acting in their English counterparts. Let's hope that trend rubs off for this project. And this post worries me. 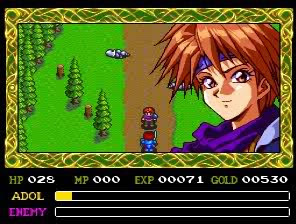 I'm recently going through the Ys series again. 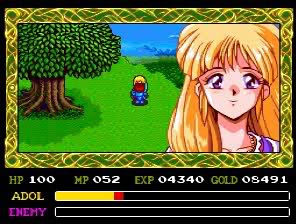 I beat Ys I - II (PCE and Complete), Ys III (Genesis, SNES, Felghana), Ys IV (SNES, PCE), Ys V (SNES regular), Ys VI (PC) and Ys Origin. The only fan translated one I played was IV for SNES. So I figure now that I've gotten all these translations, I'll go through em all again. Right now I'm in Darm Tower in Ys I Complete. So I've got a lot ahead of me. Anyways, viruses in the Nightwolve patches is news to me. I'm gonna scan em with Sophos. Just right click scan each one. If nothing comes up, I should be okay, right? I'm not very computer savvy. 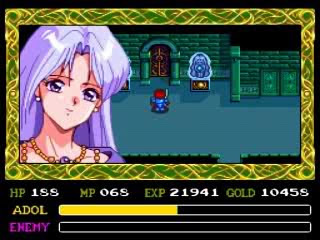 My copy of Ys IV on the Duo came pre-patched (really worth playing in English - it's amazing). The virus thing I read on the RHDN forums - and it scared me just thinking about it. The Felghana patch I got from someone who assured me it was clean (it was an old version from way back). But please people, scan everything you download. it's only common sense. Meh, I only use Windows on my folk's computer, I'm usually rocking a '99 G3 400MHZ with OSX 10.3 or little netbook with Ubuntu, so there's not much for me to scan for. Mostly I just have to worry about intrusions, and 9 times out of 10 those are just people trying to connect to me (I dunno how) but no viruses/trojans/backdoors. I can see the wisdom for the M$ users out there, though. As controversial as Nightwolve's behavior has been, I feel it is unfair to completely tear into him in this post with outdated info. As of late, he has made a new website, containing most of his patches, which are free, and have NO viruses as far as I know. Also, he has said on his site that he is highly supportive of this dubbing project and will add it to the next version of the patch (which is free, BTW) if and when it is finished. Please don't breed fear based on something you do not understand fully. Nightwolve may have made a mistake in reacting the way he did, but I'll bet all of us have done the same at some point. Thank you for the post about this project, but please rethink your comments.